I know that this is the big sports issue here at The Escapist, and at first I was planning on going against the grain a bit to talk about how gaming as a "professional sport" is the most ludicrous thing I have heard this side of Ozzie GuillÃ©n. But that lacked any real teeth because, well, gaming isn't a sport and that's pretty much the end of the debate. So instead I decided to rip on the sports gaming genre - not because I want to or because I get any amount of joy out of doing so, but as a lifelong sports gamer, I'm fed up. Before I jump in with both feet, a bit of history is in order. Every gamer has a history tree, and we can look at that tree as if it were filled with family members, but instead of tracing your lineage back to Great Uncle Rufus, gamers trace their roots back to systems like the Atari 2600 and Intellivision. Think of it as a Geek Tree: The deeper your tree, the deeper the geek. Gaming was already mainstream and cool by the time the PlayStation 2 rolled around, but if you can hang something like the Apple II on your tree, you're a certified first-generation gaming geek and most likely have different expectations from the games you play. Take my tree, for example: Atari 2600/Intellivision/Commodore-64/Three Year Drunken Haze College Break/PC. The sports games in the tree also run the gamut from Intellivision Football, The World's Greatest Baseball Game, 4th and Inches, Hardball!, Front Page Sports, right down the line. With that out of the way, let me explain why sports games are dead to me, and how publishers have collectively destroyed what was once a creative, developer-driven part of the game industry. I realize that for many sports gamers, the yearly release of Madden is akin to a national holiday, but this is a huge part of the problem with today's games. It's why they're complete and total scam jobs. Developers have around 10 months (if that) to crank out a brand spanking new game - one with just enough new features to fill a fact sheet and highlight the back of a gaming case. 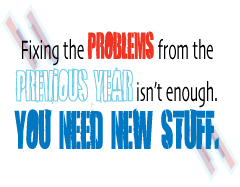 And fixing the problems from the previous year isn't enough (or even on the docket some years). It's an almost impossible task for the developers, but the publishers work this like a well-oiled machine. When was the last time an EA Sports or 2K Sports game missed a release date and was pushed back? So, either these games are programmed so brilliantly they make the people at Valve and Blizzard look like incompetent hacks, or something else is going on, and it's not nearly as exciting. These games are in no way developed with the idea of making the best possible product, but rather are designed to be the best possible product in the short time before the next release is due. That's a big difference. Time is the mortal enemy with sports games, because publishers feel the need to ship these games before the season even starts. Seriously, what says "baseball" more than February 26, which happened to be MLB 2K7's release date?